The usability of the typical blog approach to RSS (directly linking to XML feeds) is very low, as Peter Merholtz , Jeffry Veen, James Bennett, and Keith Robinson have all noted. The problem is that users don’t know what RSS or XML is, and certainly don’t want to look at XML code. The answer to the RSS usability riddle is that subscription needs to be framed in terms of the tool the user is subscribing with. “Add this to Bloglines” makes much more sense to the average reader than “XML” or “RSS”. 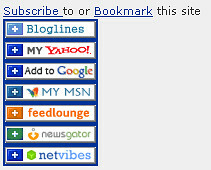 Unfortunately, as RSS readers proliferate, this means that more and more links need to be added to your site (“Add this to MyYahoo,”, “Add this to MSN”, etc). My widget solves this problem by hiding the links until they are needed. The code was easy as pie to write. Below is a brief explanation of how I did it, with relevant code snippets. 1) Hiding and revealing the widget (which is wrapped in a Span) is accomplished by simply setting el.style.display to “none” for the Span that holds the widget. //TODO: use window.location.hostname, host, or SOMETHING!!! Next Article Webyantra … the techcrunch of india? That’s a pretty tidy bit of AJAX. For the social bookmarking though I use socializer, which centralises all the social bookmarking sites into 1 page for you. That’s not to dismiss you very beautiful solution to all those ugly logos, I don’t believe there is currently a version to handle RSS feeds. Thanks for your kind words, Jolyon! Socializer adds an extra step to the process (Go to another page, THEN select bookmarking system, instead of selecting it in page). However, they support WAY more bookmarking systems then mine does or ever will. They should make a little widget like mine … that would probably be really popular! Maybe you can offer a simple RSS link as well? It was kind of hard to add you to my feedreader. I offter a straight RSS feed as well (on right column, below the fold). What problem did you have adding me? Do you use a reader I don’t support? Or did you encounter a bug or usability issue? Hello. I’m not sure how I found your page, but I’m interested in adding this code to my pages, if possible. At first I thought I could cut and paste the .html from the source view. However, I notice that this would reference your site for images and such, and that’s probably not what you want. Do you have time to explain more fully? I have added links to a file that has the entire html needed. I also added links to the .js and .css files. 1)upload js and css files to your own server. 3)add links from head of your html, and add the html wherever you want it in your blog template. 4)Download images from my site, upload to your own, and change the links. Hope that helps! If theres a lot of interest in this widget I might package it in a more user-friendly format, but no time at present! The first suggestion makes sense. I had this problem with my other AJAX widget, the category browser (on the right column). I had to make it invisible until the page had loaded, because otherwise I got a flicker effect like I’m describing. But I guess it is a trade off really. Just another instance of accessibility clashing with usability.